Over the past three decades, the discipline of financial analysis and accounting has changed significantly. One of the business changes has to be the use of EBITDA. This financial metric was barely used until the leveraged buyout boom of the 1970s and 80s when it became commonplace to use EBITDA or earnings before interest, tax, depreciation, and amortization when valuing companies. Private equity quickly discovered that by stripping out interest costs, tax and items related to capital spending, you can present a much more favorable view of a company’s financial situation, even though it might not be accurate. But despite Buffett and Munger's criticism, EBITDA continues to be used by analysts across Wall Street to evaluate companies. Rather than falling out of favor, the measure is becoming more prevalent. The usefulness of EBITDA when it is combined with a company's enterprise value is the focus of Michael J Mauboussin's latest research report. Titled, "What Does an EV/EBITDA Multiple Mean?" The report is an investigation into the EV/EBITDA multiple, which is a "widely used and misused approach to valuation," although rather than recommending investors outright ignore EV/EBITDA, the paper outlines some recommendations as to how to use the multiple as effectively as possible. According to Mauboussin's paper, today EBITDA is one of the most popular financial metrics used by investors. He points to a recent survey of 2000 investors that found the two most popular multiples are price-to-earnings (P/E) and EV/EBITDA. 88% of respondents used for the former while 77% relied on the latter. And it's not just investors who are increasingly turning to EBITDA as their preferred evaluation metric. Mauboussin notes another research paper, this time focused on companies themselves, which analyzed tens of thousands of annual reports and earnings releases for companies in the S&P 1500 for the decade ending 2016. This study discovered that roughly 15% of all the companies considered highlighted EBITDA. Unsurprisingly, the companies emphasizing EBITDA were on average "smaller, more leveraged, more capital intensive, and less profitable than their peers." While EBITDA use is now widespread, in the early 1970s it was still a relatively unknown term. Trying to pinpoint the exact moment when the word started to find its way into annual reports is all but impossible. However, Mauboussin highlights Will Thorndike, (an investor and the author of The Outsiders) thesis that John Malone was one of the first CEO's to pioneer its use. 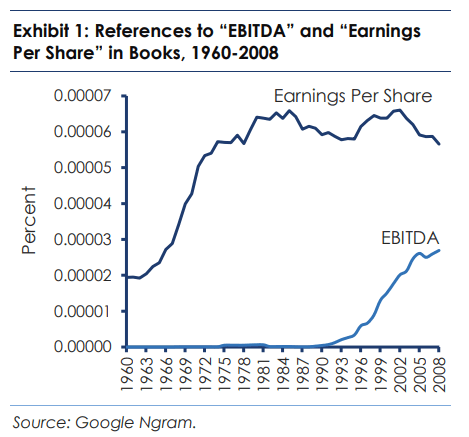 Using Google book scans, Mauboussin notes that references to EBITDA in books were virtually non-existent until 1973, the year John Malone joined Tele-Communications, Inc.
EBITDA has some very severe limitations, which is why Warren Buffett, Charlie Munger, and Seth Klarman all overlook companies that make heavy use of EBITDA in their financial statements. For a start, EBITDA is not subject to generally accepted accounting principles (GAAP) and, therefore, "encourages companies to take some liberty and how they define the term." The most common adjustment Mauboussin notes is "adjusted EBITDA, which removes non-recurring items such as restructuring charges and impairment costs and adds items such as acquisition synergies and other anticipated cost savings." As there is no set definition of what adjusted EBITDA many other different variations have sprung up, including a favorite of oil companies, EBITDAX (where X= exploration expense) and WeWork's metric of choice: Community adjusted EBITDA. "The potential danger in using EBITDA is that it understates the capital intensity of the business. As a consequence, EBITDA overstates the amount of cash a company can distribute while running the operations appropriately." Mauboussin goes on to say that as well as overstating a company's cash flow potential, EBITDA does not explicitly reflect business risk or operating leverage and by ignoring tax charges, you could end up with two different valuations for two different companies that have different tax rates. So, EBITDA has its uses, but it also has plenty of drawbacks. The question is, is it useful? Mauboussin's paper finds that EBITDA can tell us something about a company's fundamentals. 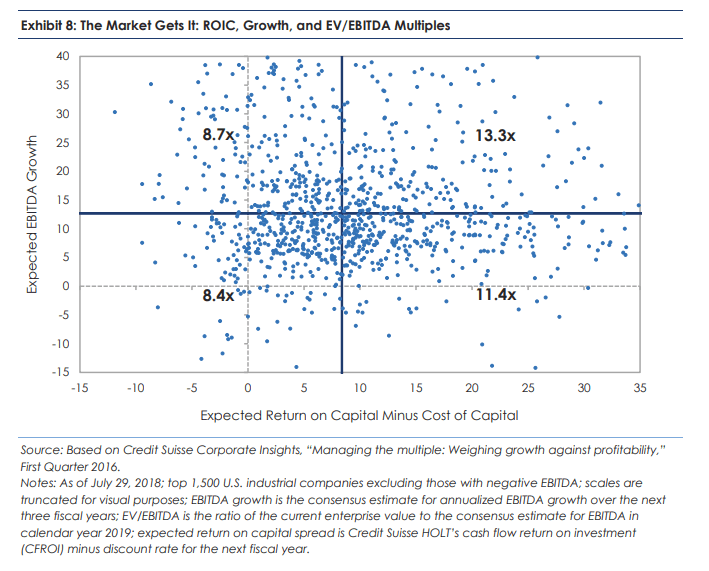 Looking at the relationship between return on capital invested, growth and EV/EBITDA multiples across 1,500 companies, the team at BlueMountain find that "high ROIC and fast-growing companies have the highest median EV/EBITDA multiples at 13.3 times, followed by high ROIC slow growth at 11.4 times." Meanwhile, the market assigns an average multiple of 8.7 to low ROIC fast-growth companies, and 8.4 to low ROIC slow growth companies. Interestingly, the researchers also find that there is a strong correlation between the use of P/E and EV/EBITDA figures of 0.79. 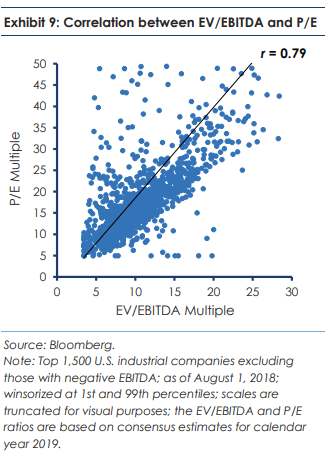 However, there are plenty of instances where two companies have the same EV/EBITDA multiple and very different P/E multiples. Mauboussin claims that analysts who use "one multiple versus the other or, more perniciously, select the multiple that makes their investment case," risk coming to a "faulty conclusion." "Evidence shows that buying a stock at a premium to its warranted multiple leads to poor excess returns and buying at a discount leads to attractive excess returns. For example, Dan Rasmussen, founder and portfolio manager of Verdad Advisers, highlights analysis that suggests more than one-half of private equity deals done at an EV/EBITDA multiple of 10 times or higher lost money, and that for every dollar put into these deals investors got only a tad more than a dollar out.37 There is nothing magical about 10 times. The essential point is businesses have different warranted multiples that are important to understand as you buy and sell their securities."